The Day before Thanksgiving Walk goes back just ten years, but it is fast becoming a Chelmsford town tradition, and builds upon the long history of Thanksgiving Forest that originated in Victorian times when the men of Chelmsford would gather in the forest each Thanksgiving for their annual fox hunt. 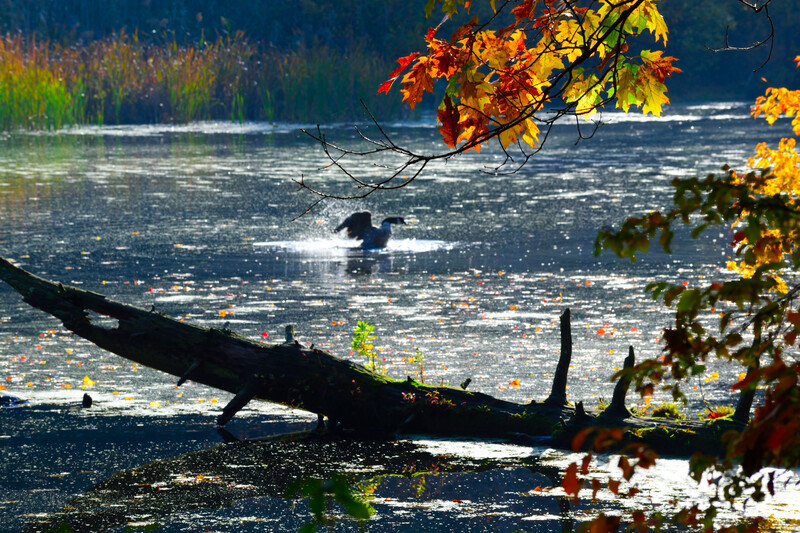 A Canadian goose takes flight at Chelmsford's Thanksgiving Forest. Hikers gather at the forest’s entrance at Janet Road, and walk through the woods, meeting at the cluster of boulders, where everyone can enjoy hot chocolate and cookies, provided by local Boy Scout Troop 74, a fire – built in the rock hearth formed by the boulders, and listen to some history provided by Becky Warren, local historian. Check out Merrimack Valley Magazine’s latest issue, which hit newsstands earlier this week, and we’d like to extend a special thanks to David McLachlan of the Chelmsford Conservation Commission, and to Tom Christiano of the Chelmsford News Facebook page, for their help with this article on Thanksgiving Forest.